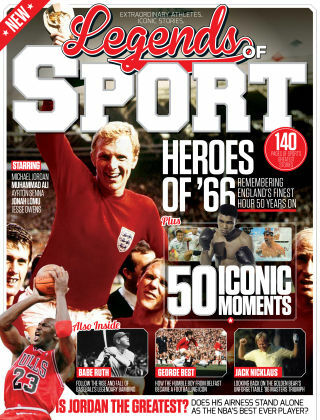 With Readly you can read Legends Of Sport and thousands of other magazines on your tablet and smartphone. Get access to all with just one subscription. New releases and back issues – all included. The world of sport is one filled with excitement, intrigue and drama. Compelling protagonists, fierce rivalries and titanic battles abound throughout history, with every discipline contributing its own iconic moments and unforgettable characters. In Legends of Sport, we tell the stories of some of the most incredible athletes of all time. From the inspirational England team who won the World Cup on home soil in 1966, to the unparalleled basketball genius of Michael ‘Air’ Jordan, you’ll find dramatic retellings of events you know and love, as well as insightful features on extraordinary men and women with whom you may be less familiar. Whether you’re a seasoned sports fan or an enthusiast eager to learn more about the sporting icons of yesteryear, you’ll find a wealth of absorbing content to keep you occupied here. Enjoy the book.